Lovers of colour take note, Killer Purps has landed! This sativa dominant wonder plant is a next level cross between a rare purple phenotype of Buzz Bomb and a classic cut of the cannabis cup winning Sour Diesel. The result is a super-dank purple strain with a killer smoke and masses of bag appeal. The plant responds well to trimming and training, and LST (low-stress training) is a good option if space is an issue. Be aware though, the Diesel genetics mean the plant can give off a pungent aroma later in flowering. The high-quality smoke and stone rank Killer Purps up there with the very best connoisseur strains! The pungent, skunky, Diesel tang is offset with a slightly sweet, citrus after taste. The stone is an instant hit, starting with a spiralling cerebral high, which builds nicely to a long lasting head stone. 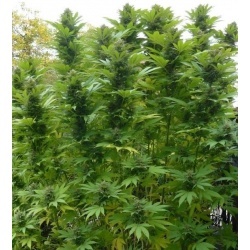 Quebec Cannabis Seeds have been breeding cannabis seeds for over 15 years now. We are dedicate to provide the best marijuana genetics possible featuring some of the best cannabis seeds strains for sale. In selecting our strains we choose only the most hearty plants with consistent, THC and CBD levels that are easy to grow for both commercial and private. All our seeds are selected and packed one by one manually, so we can ensure that they meet our requirements. "great services i ordered 10 purple kush and i recieved 15 purple kush and 5 automazar you guys are the best Thank You very much :)))"
" thank you service super fast and love all the little extra in the package will do business with you again for sure thanks "
"First time dealing with this company. Great experience. Would definitely recommend it. Very fast service." "Top Notch Seedbank and Genetics from these Guys. Customer service was great with super quick response and shipping. Thanks again QCS :)"
"This is the best place to get seeds from nothing but good stuff"